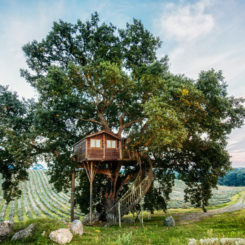 It might have been your childhood escape: A backyard treehouse where you could hide away to play pretend, read or just while away an afternoon with your best friend. 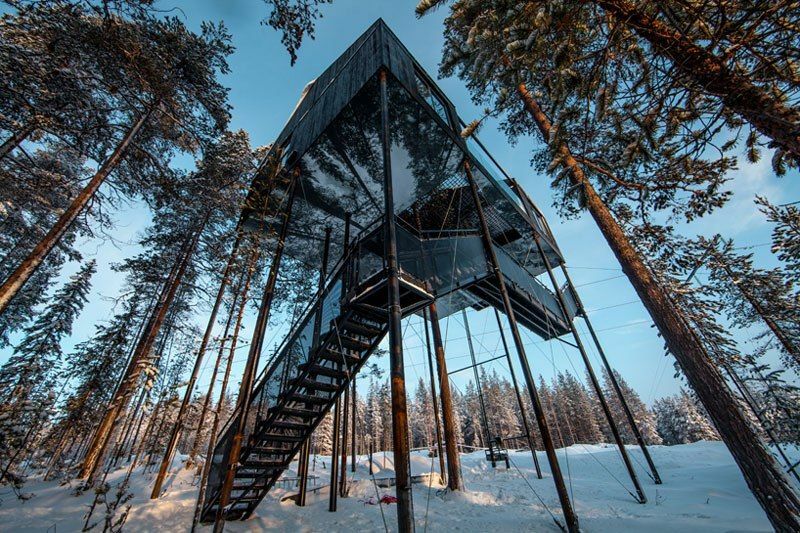 How about an adult version in the form of a treehouse hotel? 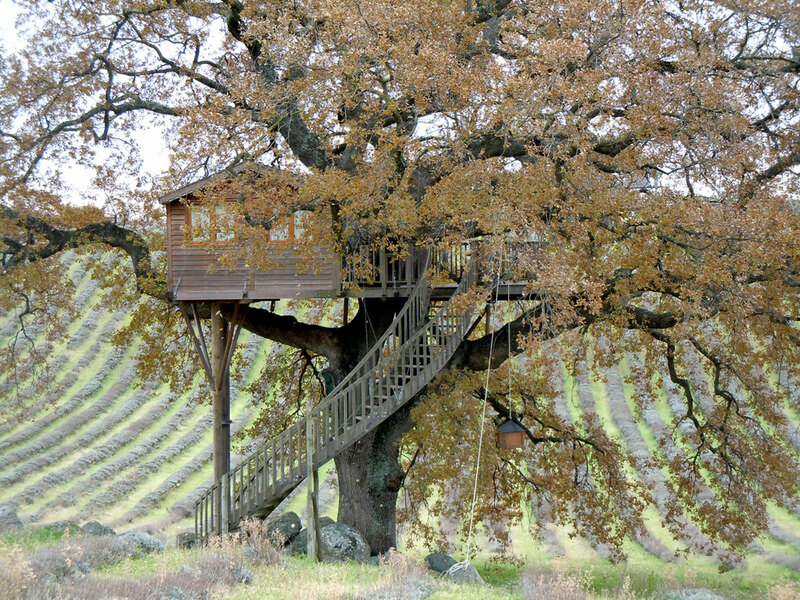 Plenty of properties provide the same kind of tree-top escape but on a more luxurious and comfortable scale. 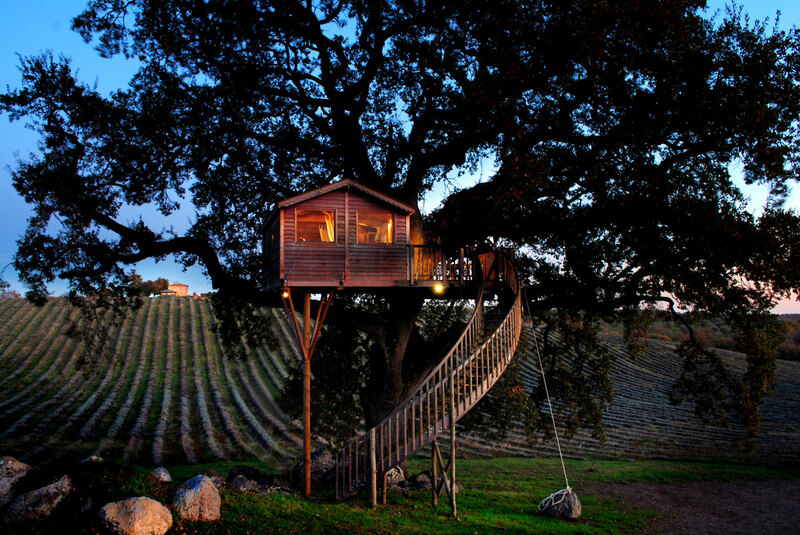 Secluded getaways offer all the amenities, privacy and, of course, a bird’s eye view of the surroundings. 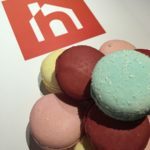 Check out these stunning properties! 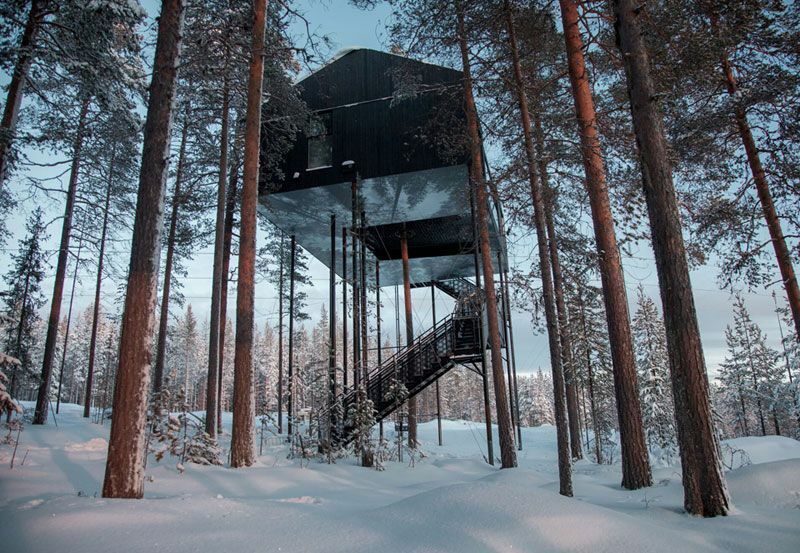 One spectacular place is the Treehotel in Harads, Sweden, billed as the “landscape hotel where nature and imagination run wild.” Situated near the Lule River, the location gives guests the escape of their dreams in all seasons of the year. 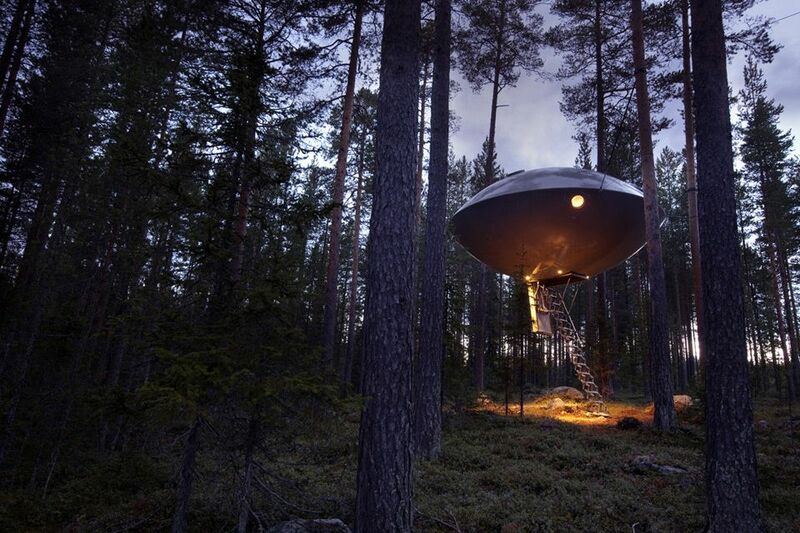 The hotel offers a number of luxurious individual treehouse styles, such as the Bird’s Nest, the UFO and the Mirrorcube. 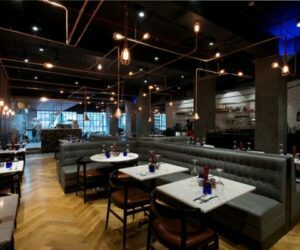 Recently, it has added another unit called The 7th Room. 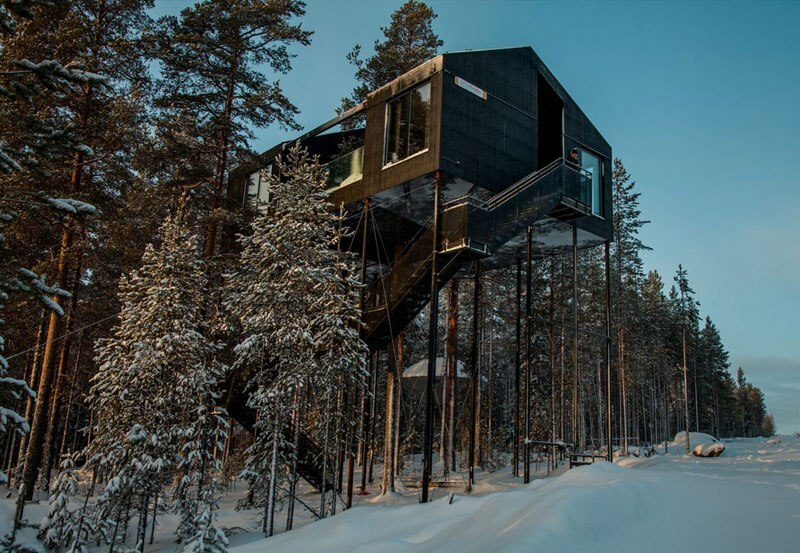 Nestled among the tall pines – 33 feet above the ground — the 75 square meters of living space includes two bedrooms that sleep up to five people. 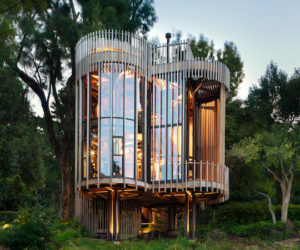 While the treetop locale might be enough for some, this unit kicks things up a notch with an amazing central outdoor space that features a pine tree soaring up the middle of the house. 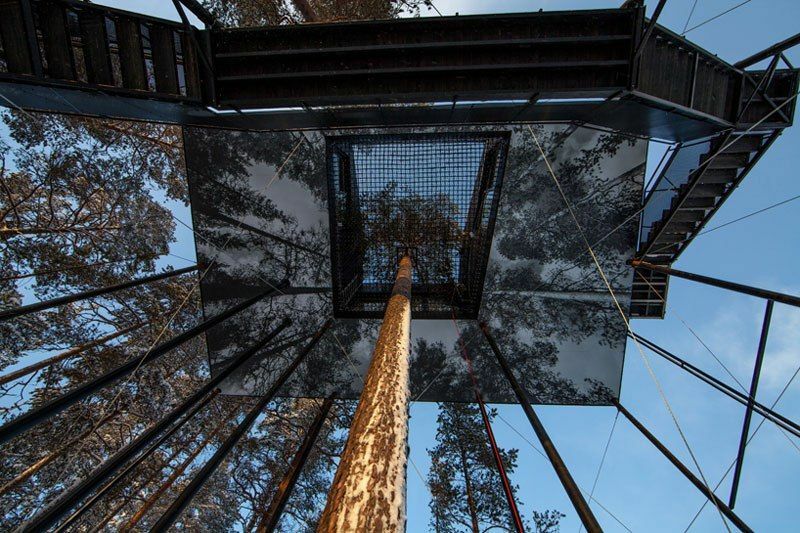 What’s more, the tree is surrounded by a large net that you can lay on and play, far above the forest floor. 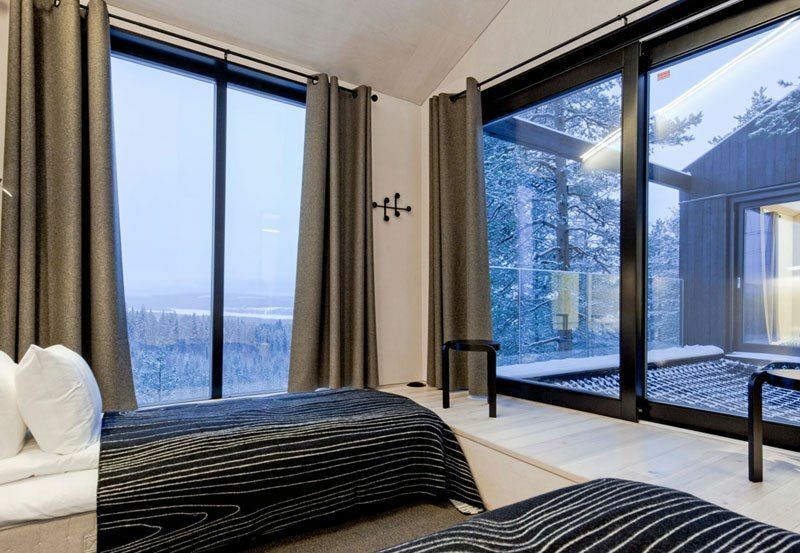 The 7th Room also provides panoramic views of the river from large north-facing windows. 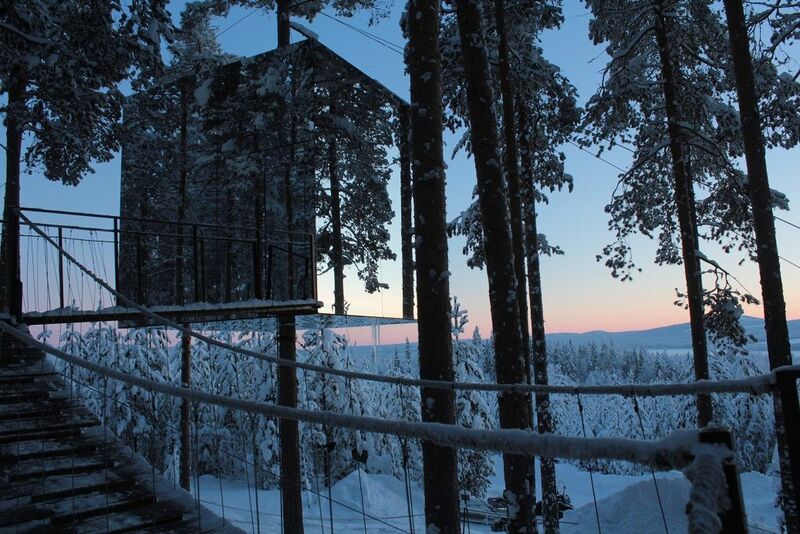 In summer, this allows for long enjoyment of the enduring daylight and by winter, it affords guests a spectacular way to enjoy the northern lights. 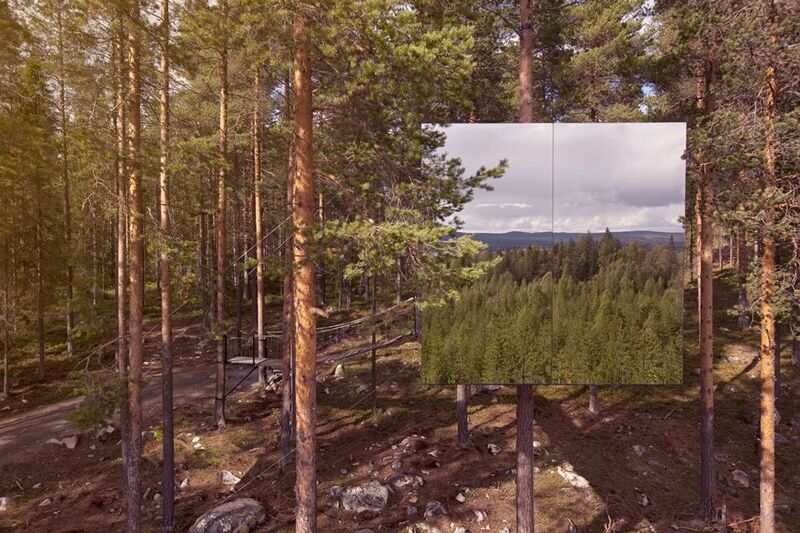 If you would like to virtually disappear into the woods, the hotel’s Mirrorcube is the unit to book. 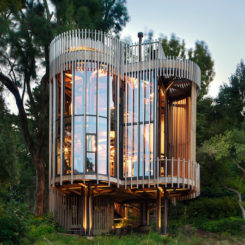 The structure’s mirrored exterior walls reflect the trees and sky, making the treehouse appear to melt into its surroundings. 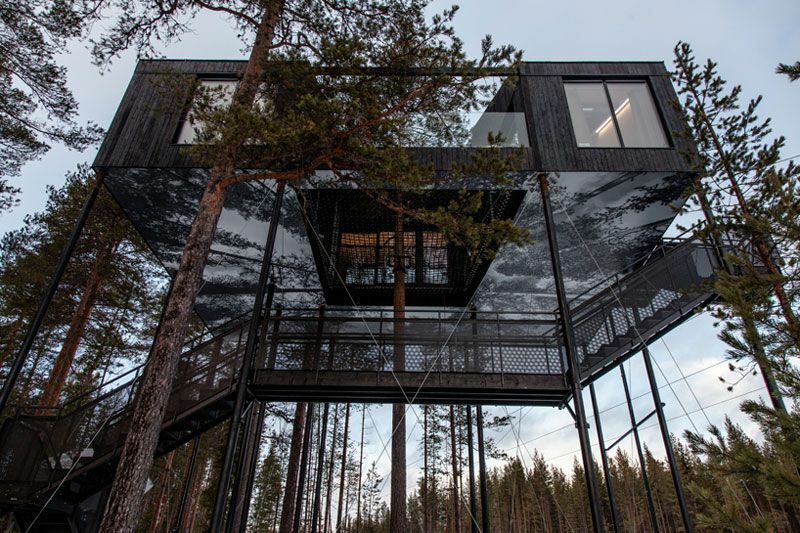 The tree-top hide-out is literally a 4x4x4-meter aluminum box that is secured to a tree trunk and clad in reflective glass. 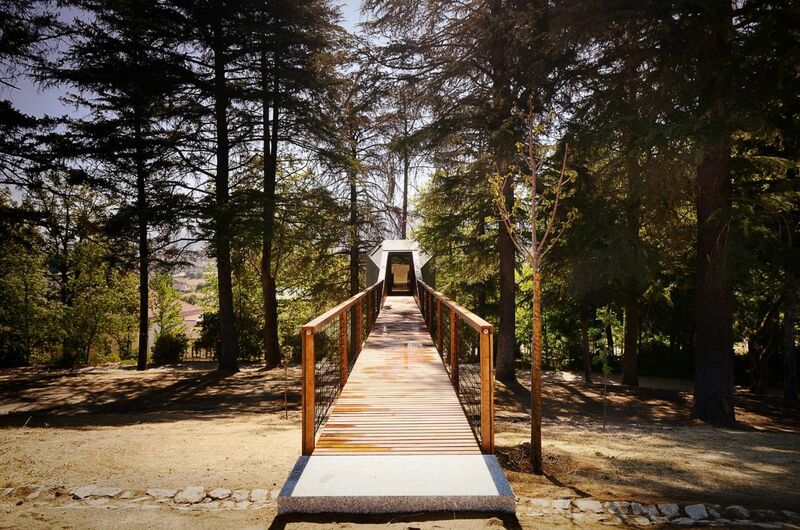 The two-person room is accessible via a 12-meter footbridge. 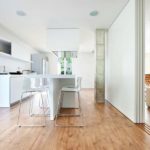 The interior of the unit is finished in plywood that has a birch-look and includes a double bed, toilets, lounge and a rooftop terrace. 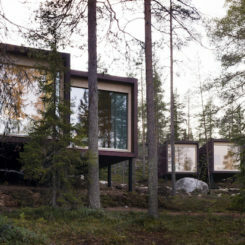 The pale wooden backdrop inside creates a natural-looking atmosphere for guests, and is highlighted by six large windows that give panoramic views of the woods and surrounding area. 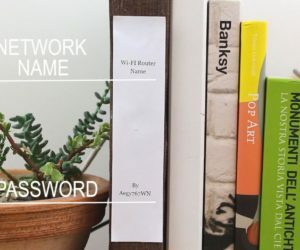 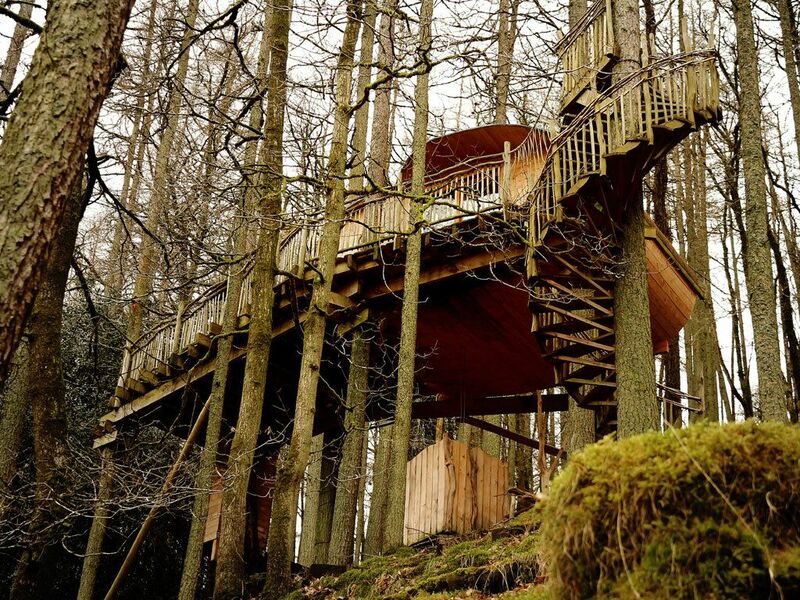 For those who cannot stand to be totally cut off from the outside world, the hotel’s tree rooms offer free Wi-fi. 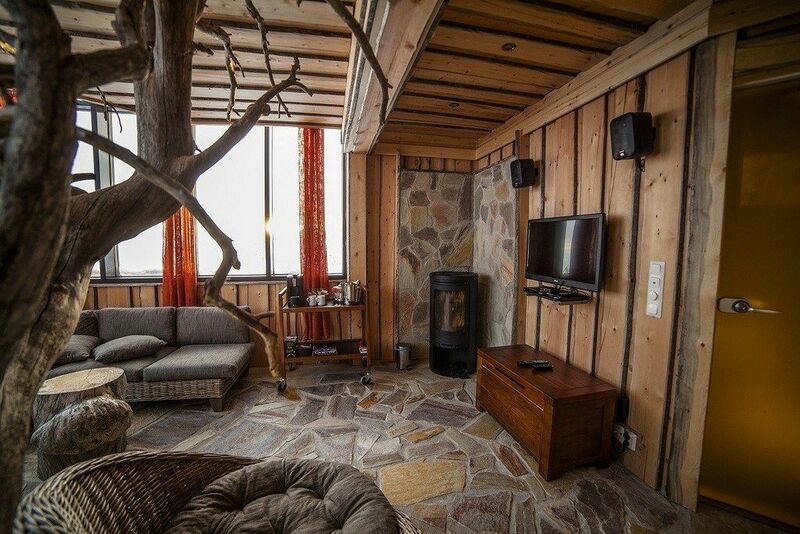 The rustic and twiggy clump that forms the exterior of this room belies the comfort that hides within. 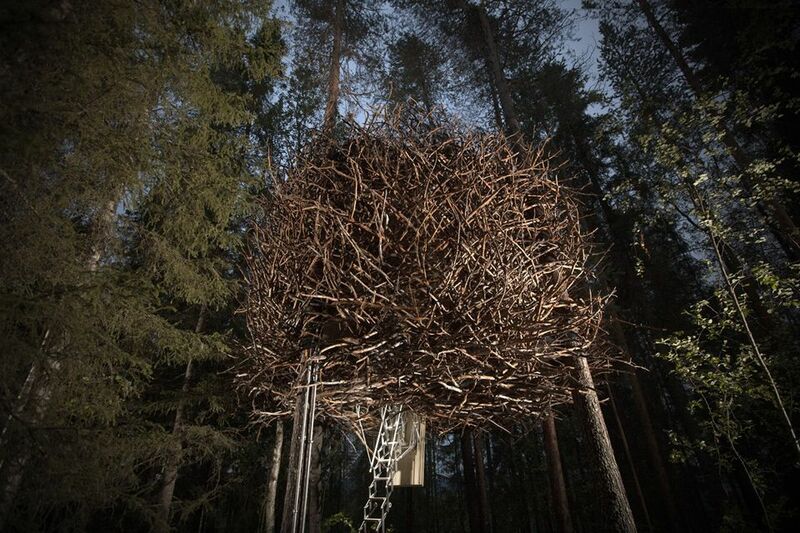 The giant ball resembles a bird’s nest and easily blends into the trees and landscape. 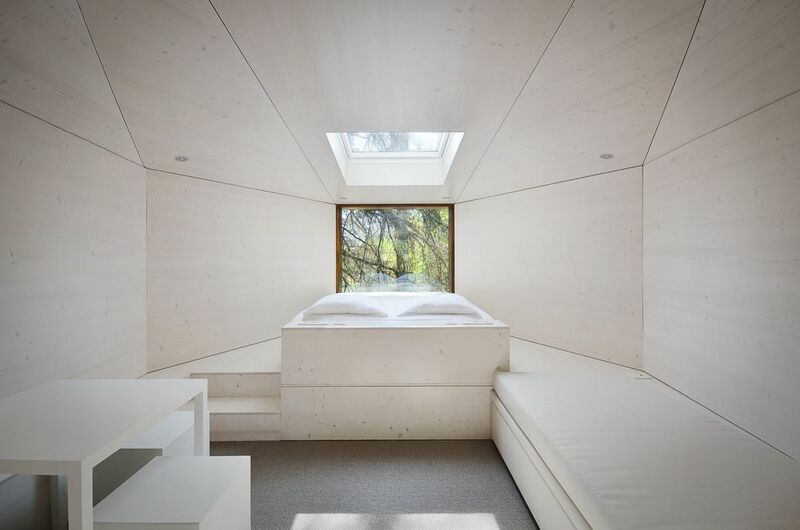 On the other hand, the inside is a comfortable escape for a family of four. 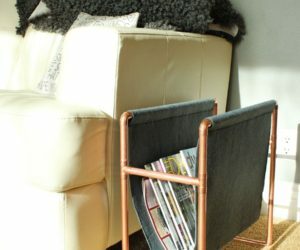 There’s plenty of space for everyone to spread out and relax. 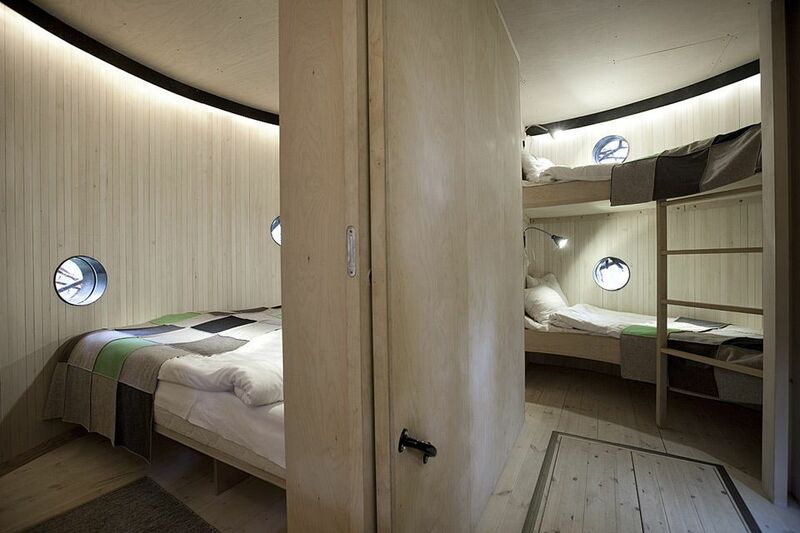 The 17-square-meter accommodation has two bedrooms, toilets and a living area. 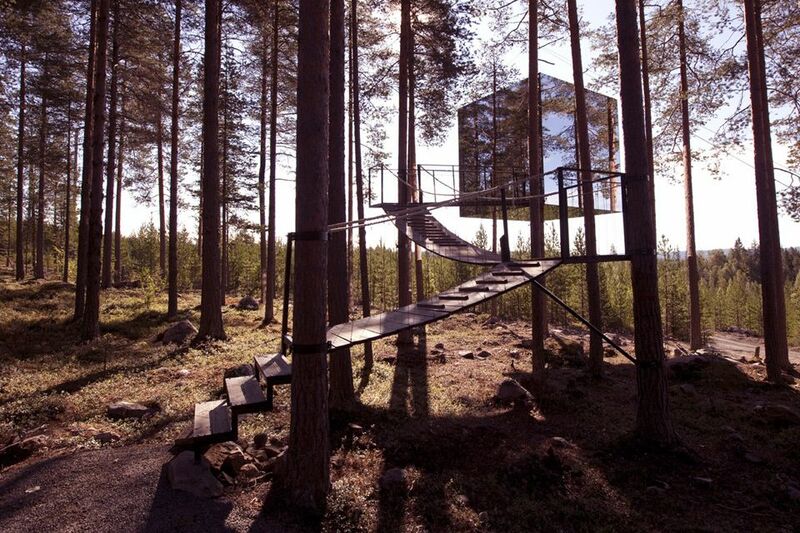 The hotel has showers and a sauna located in separate buildings that are near the treehouse. 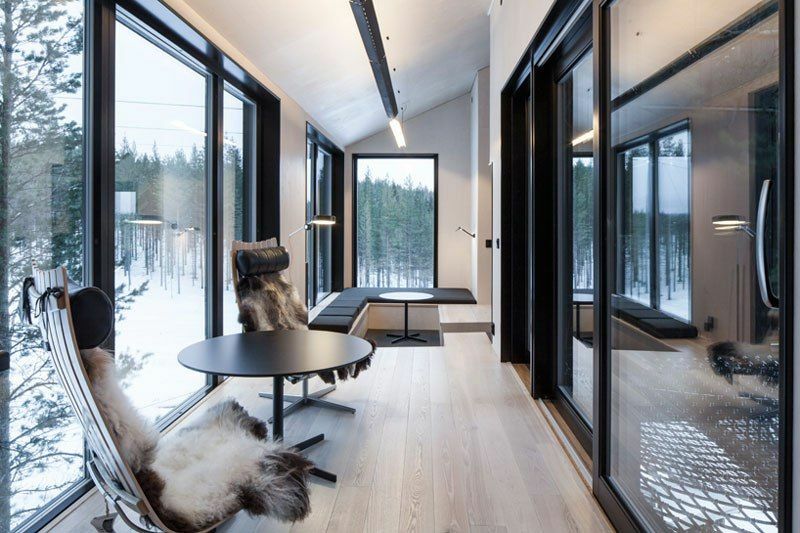 The windows in this unit are like like portholes that allow guests to spy on the surrounding landscape because from the outside, the twiggy design camouflages the windows. 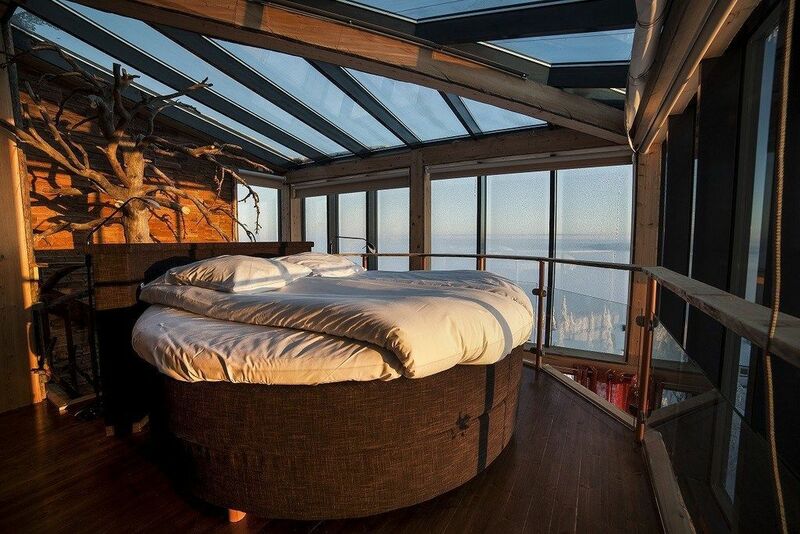 At night, when it’s time to sleep, you can complete the feeling of being secluded in a nest by pulling up the retractable stairs. 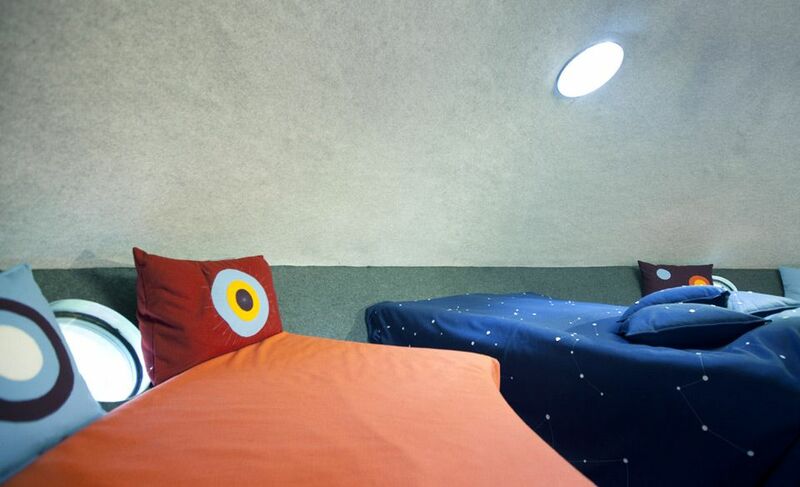 Fans of science fiction and extraterrestrials will love The UFO room because it lets you escape to the fiction of childhood. 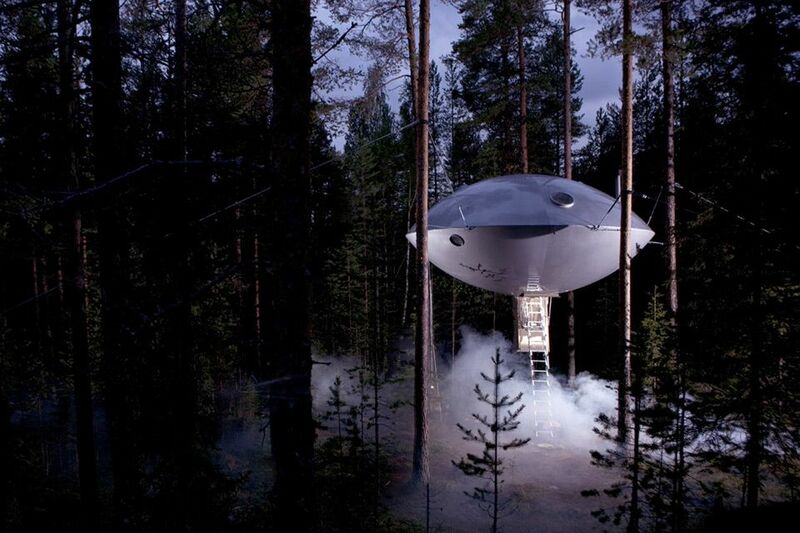 Unlike many of the other rooms, which are designed to blend in with the natural surroundings, the UFO is a completely different design concept. 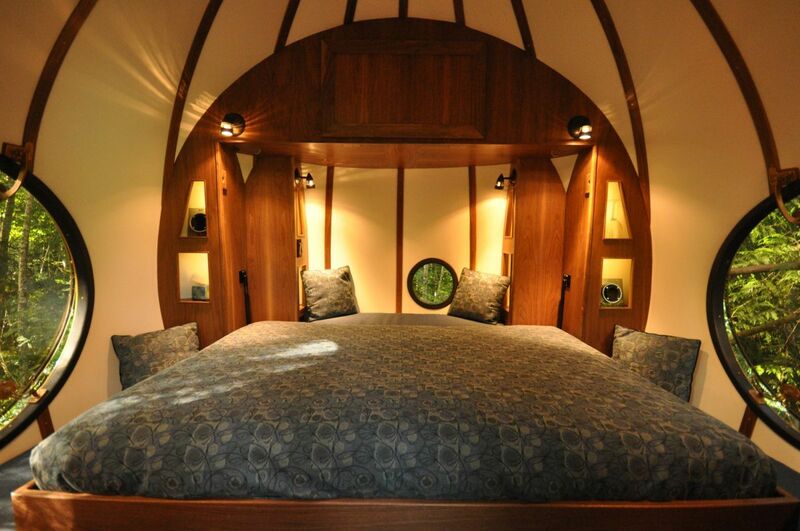 Like the stuff of movies about aliens, this room looks like a retro flying saucer. 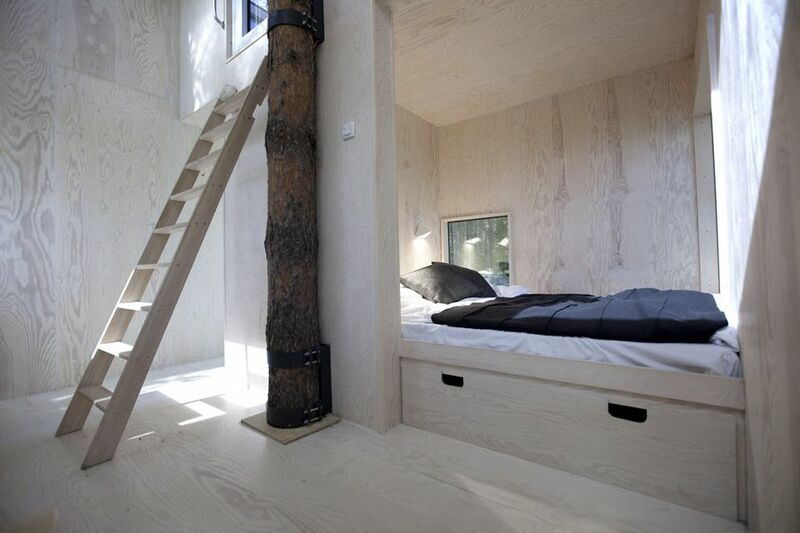 Meant to accommodate five people, the 30-square-meter unit has a living area, toilets and separate beds. 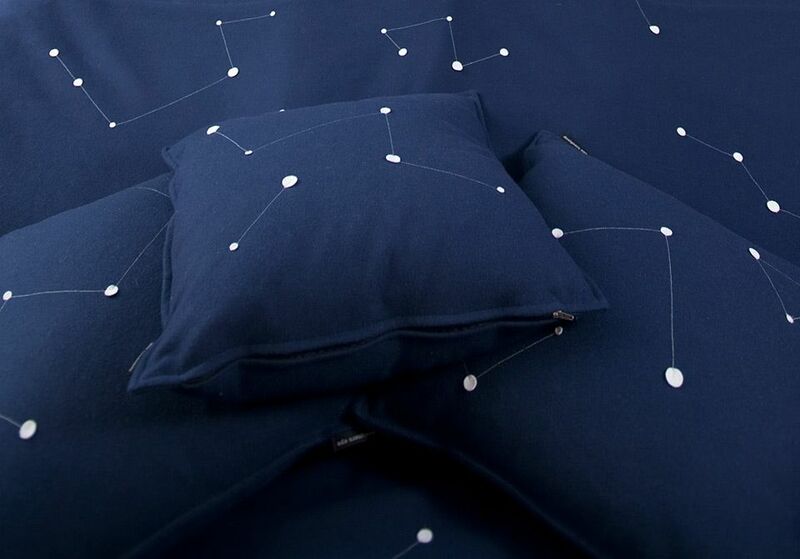 In fact, the bedding and decor fit right in with a space-age theme, sporting graphics of ringed planets and constellations. 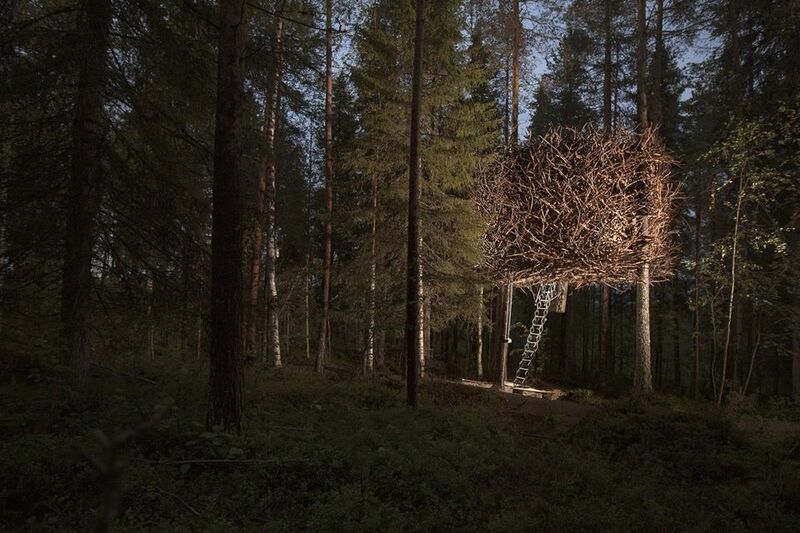 The exterior of the treehouse is made from composite materials that are lightweight, durable and sustainable. 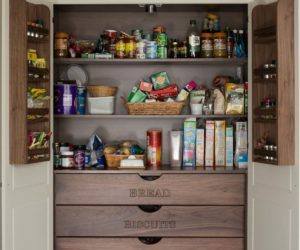 As with all the rooms in the hotel, guests have access to Britta’s Pensionat, which serves all daily meals in an authentic 1930-1950’s setting. 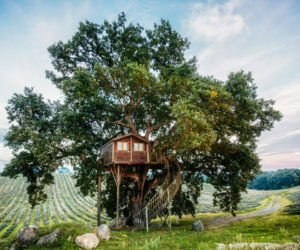 Situated in the center of the lavender fields and olive groves of central Italy, La Piantata Hotel in Arlena di Castro offers two treehouses in addition to more typical bed and breakfast accommodations. 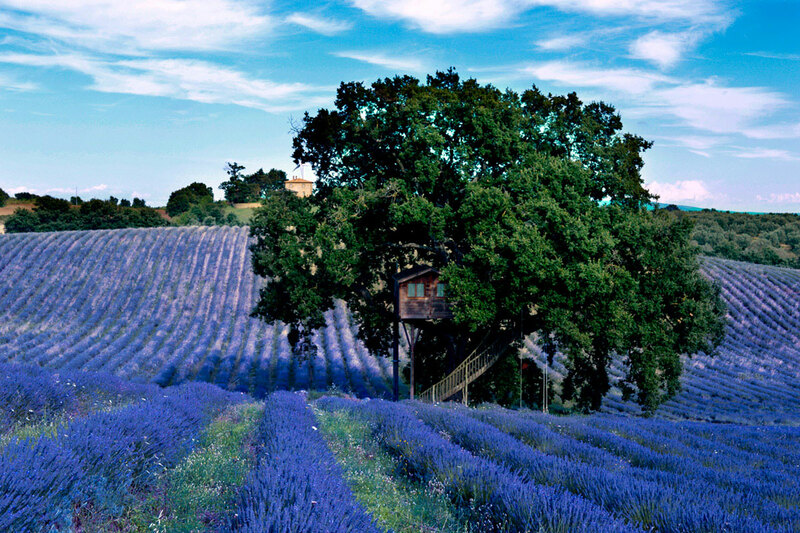 The upscale B&B consists of an 18th-century stone farmhouse and outbuildings, including Suite Bleue, one of the two treehouses. 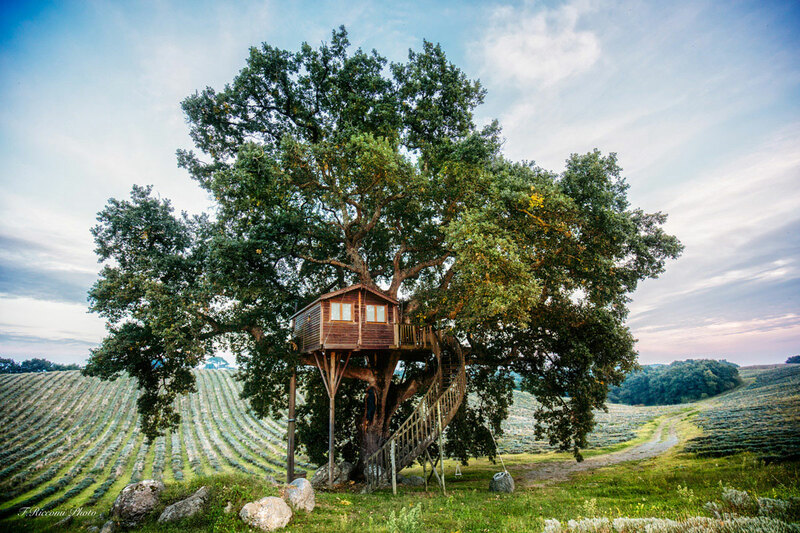 Installed eight meters off the ground in a century-old oak tree, the double-bedroom unit includes a wonderful bathroom with a shower and hairdryer, and a terrace for enjoying the spectacular countryside. 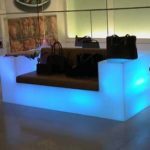 While the property itself is a calm getaway, Suite Bleue takes it a step further and is the perfect place for seclusion, complete with wireless speakers for guests’ favorite mood music. 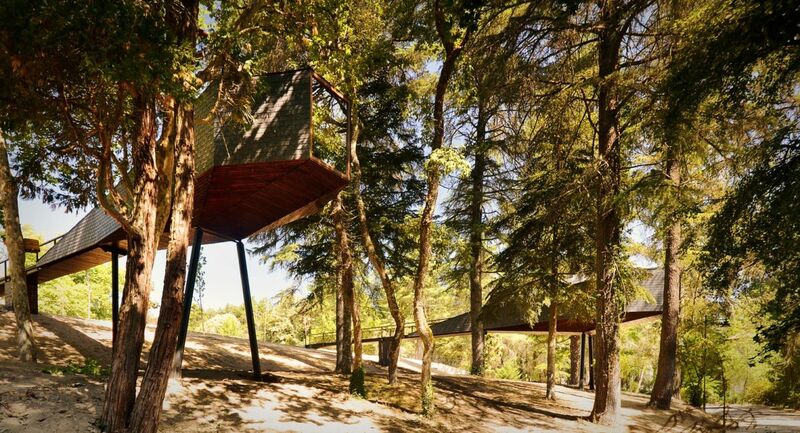 Also, there is no need to abandon seclusion for breakfast: Your private meal is delivered via a pulley system. 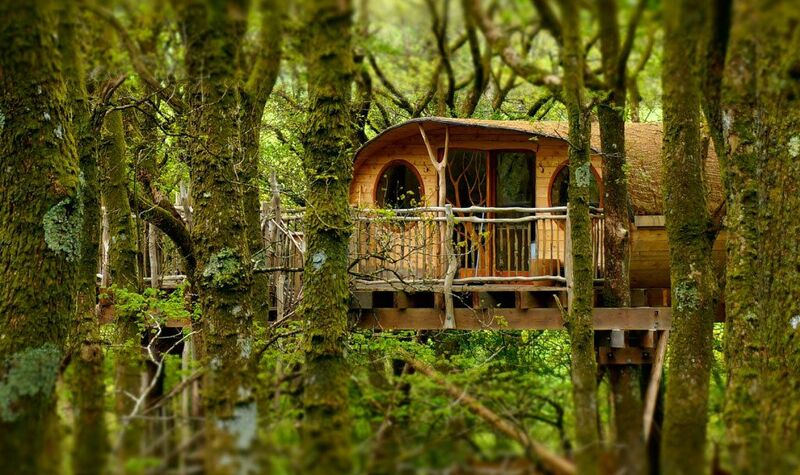 Tucked away in a remote location in the mountainous woodlands of Wales, the Living Room Tree Houses offer a refined yet adventurous experience. 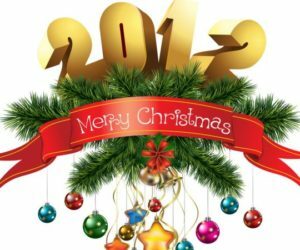 The selection is six very lofty rooms: Most sit 25 or 30 feet off the ground, with one at 15 feet for families with smaller children. 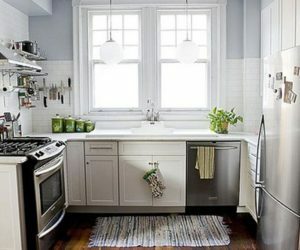 While these houses have no electricity, they are all insulated, equipped with a wood burning stove for heat and hot water for the spring water shower, and set with a fully functioning kitchen. 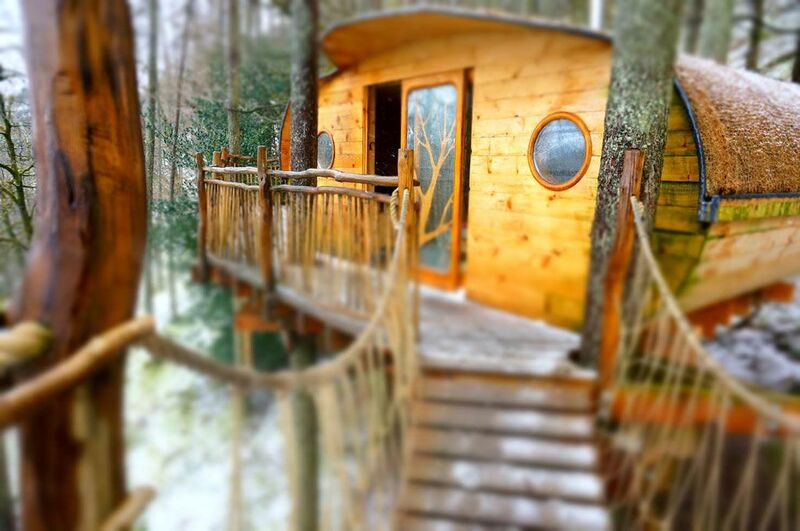 Families, couples and single travelers can enjoy the privacy of the treehouses that are set a good way apart from one another and are accessed via spiral staircases. 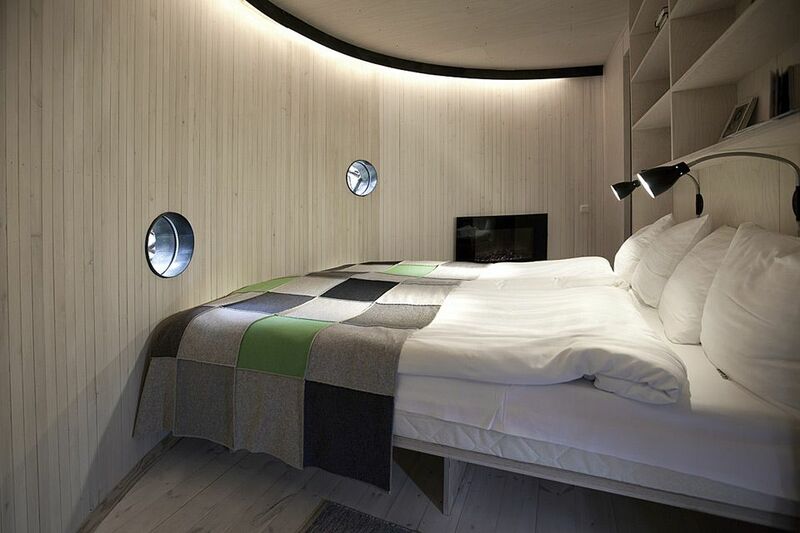 The interiors are decorated with natural wood in a way that highlights the patina and grain, and porthole windows offer views of the woods and let in the moonlight. 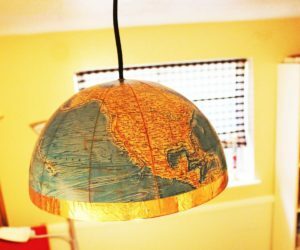 They are the perfect place to cozy up and read by candlelight or just enjoy games and conversation with the family. 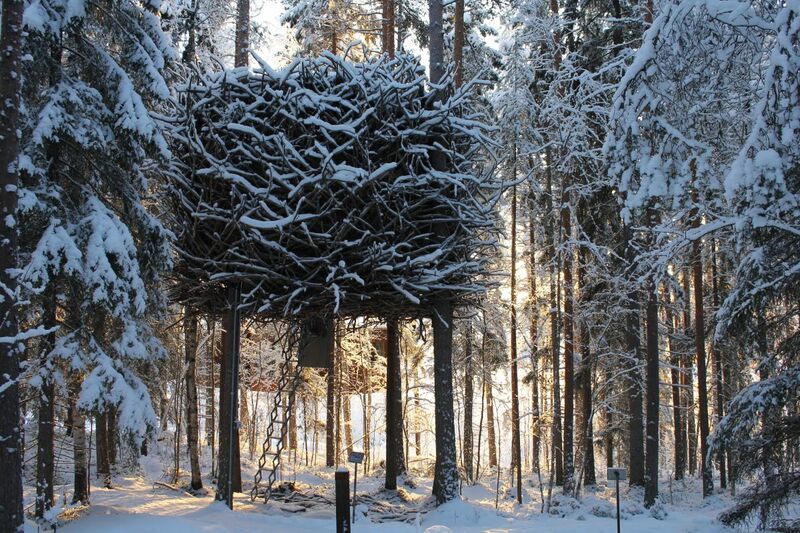 For those whose preferences run more toward the camping end of the spectrum, Tree Bones offers the Human Nest. 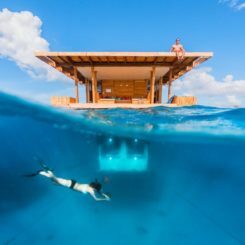 More of a rustic camping experience than a luxury hotel option, the Human Nest offers unparalleled views and opportunities to commune with nature. 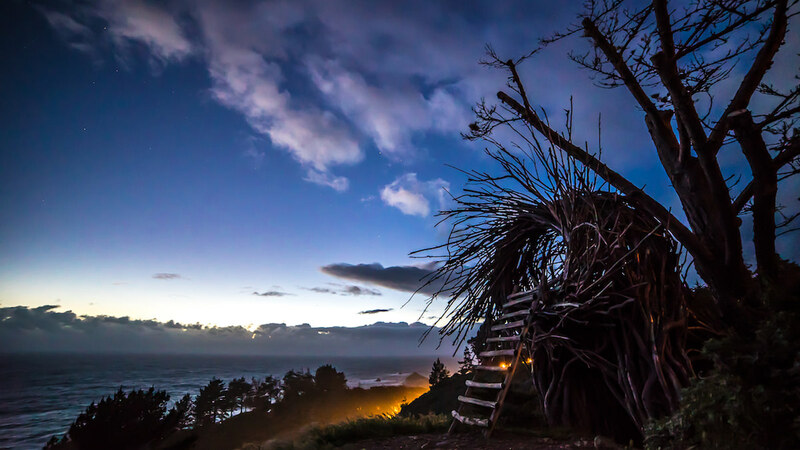 Primarily, the nest is a piece of wood art that was created by Big Sur artist Jayson Fann — and it really does resemble a nest perched on a hill by the ocean. 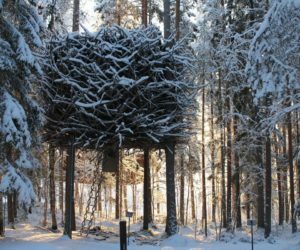 Guests bring their own sleeping bags and pillows and sleep in the nest for the night, as long as it is not raining as it is not weatherproof. 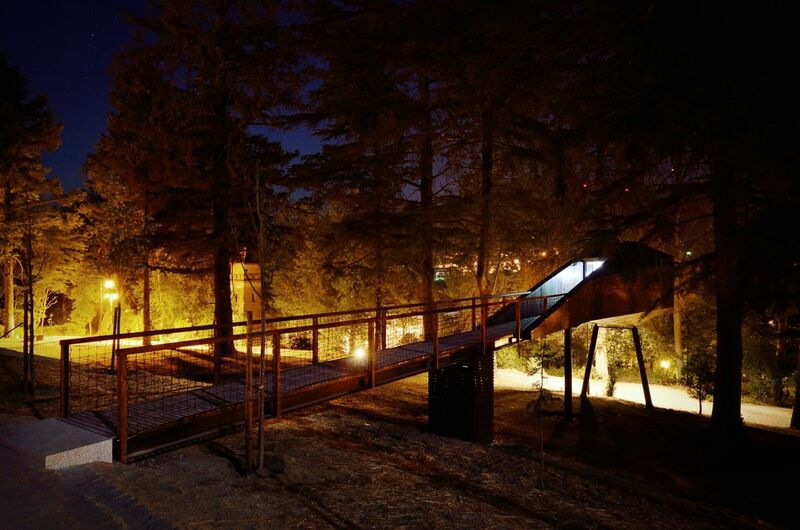 A night in the nest is also an opportunity to get close and personal with wildlife because raccoons, bats and sometimes field mice also like to visit the structure. 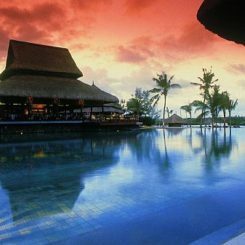 Despite the rustic accommodations, this must be the most fantastic place to greet the sun shining across the sea in the early morning. 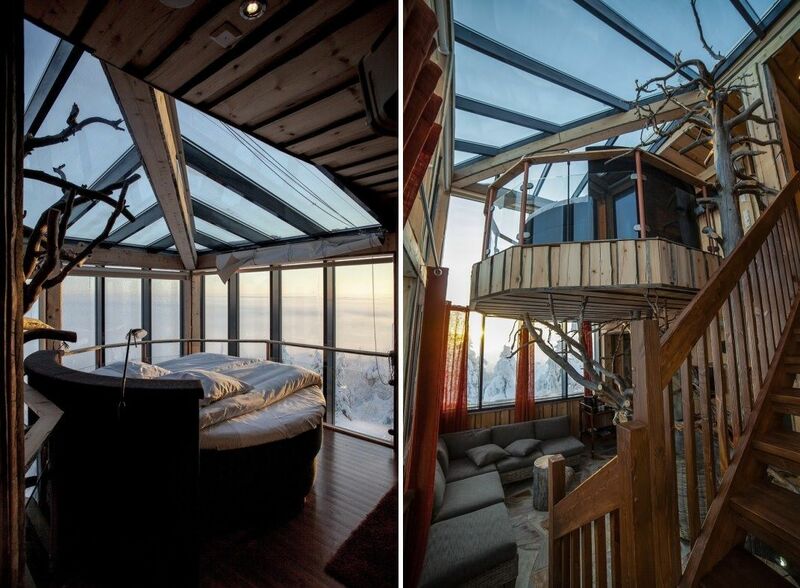 While it technically isn’t a treehouse, the Eagles View Suite at the Iso Syöte Resort might as well be because the interior feels like a treehouse and the views from every square foot are definitely soaring! 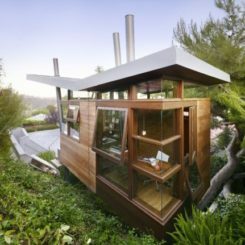 The two-story suite is luxurious in every way, offering 360-degree views of the surrounding area from its location on the hilltop. 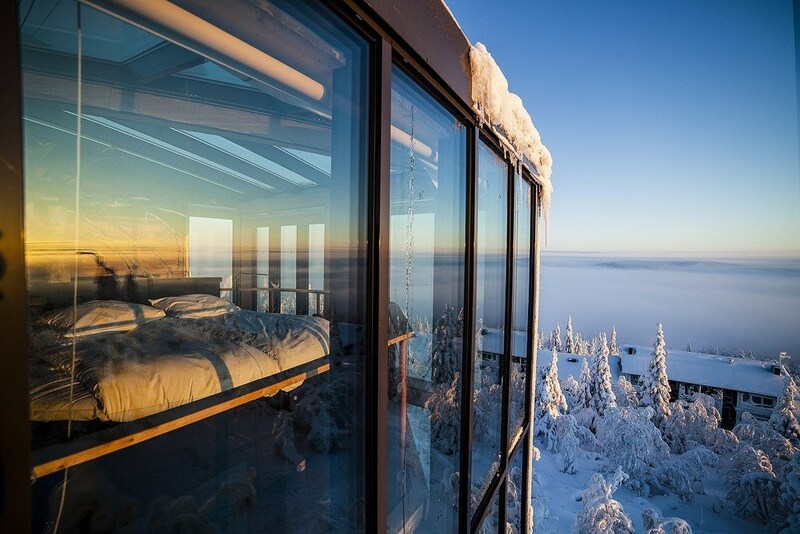 The glass roof and walls let guests make the most of the midnight sun in the summer months and have an unparalleled view of the northern lights in the winter time. 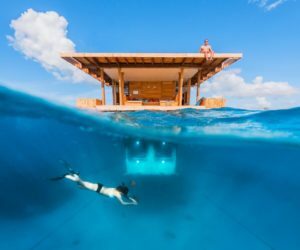 Amenities include a fireplace and a luxury bathroom with sauna. 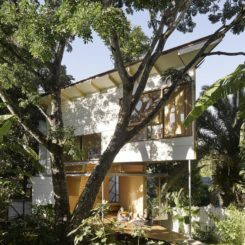 The most unusual aspect is the tree growing up the middle through to the second floor. 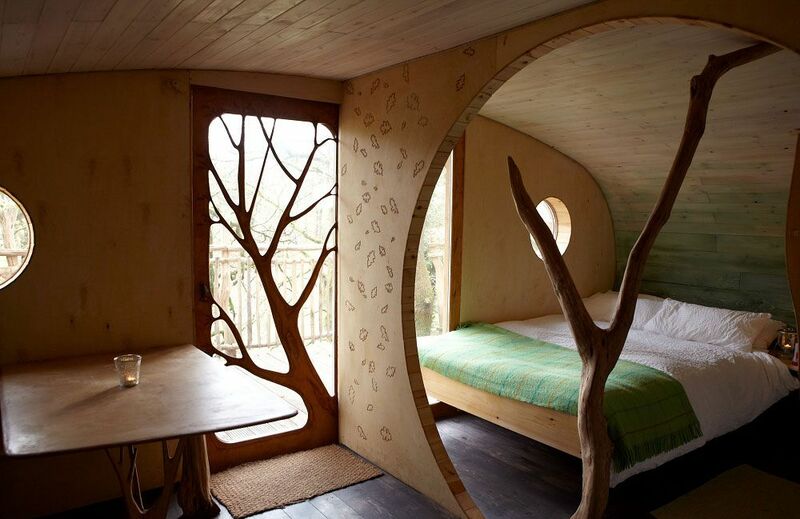 The branches of the tree support the bed, which is like a nest. 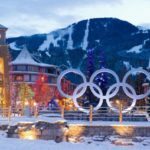 Guests at the suite also have access to all sorts of winter sports including downhill and cross-country skiing, snowmobiling, snowshoe hiking and reindeer and husky safaris. 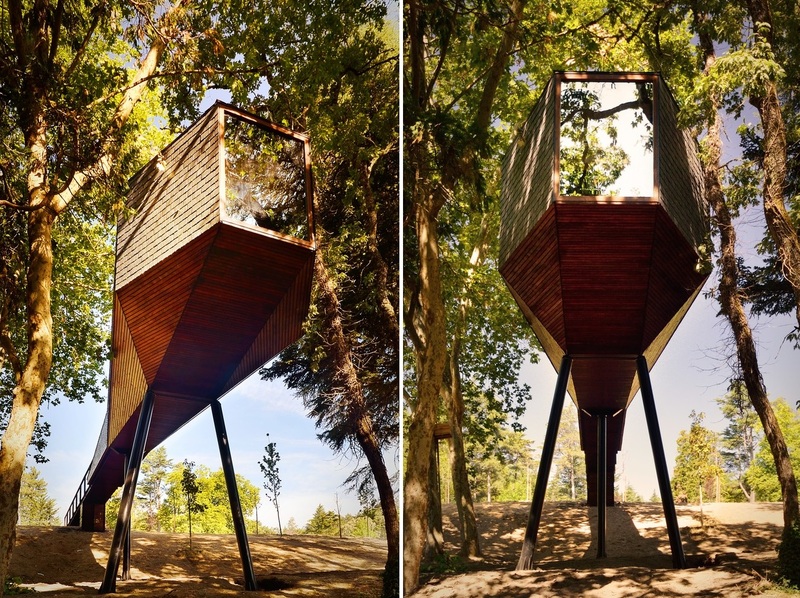 Referring to the long and serpentine shape of the buildings — not to the actual reptiles — the Snake Houses of Pedras Salgadas Park include all the childhood fantasy elements of a treehouse, achieved through a new style of modular building. 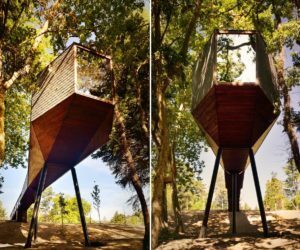 Architects Luís Rebelo de Andrade and Tiago Rebelo de Andrade designed the shape to evoke the feeling of a snake gliding between the trees. 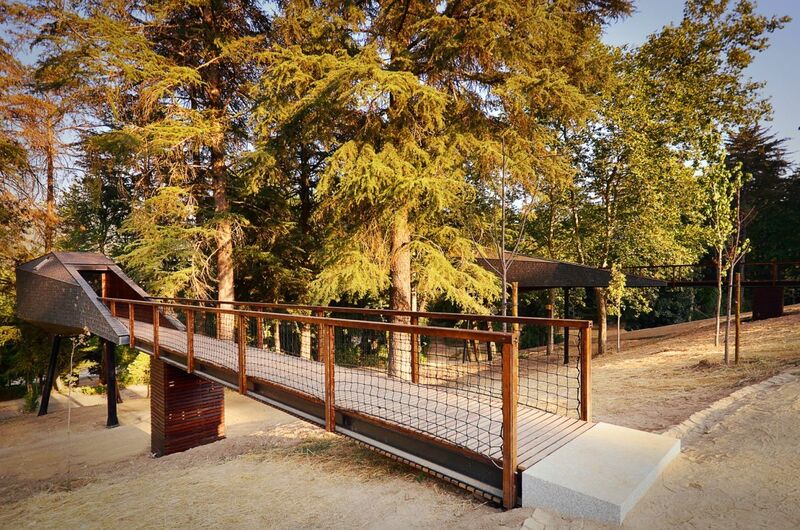 The construction materials are fitting for the forest location and the native raw materials used include slate and wood. 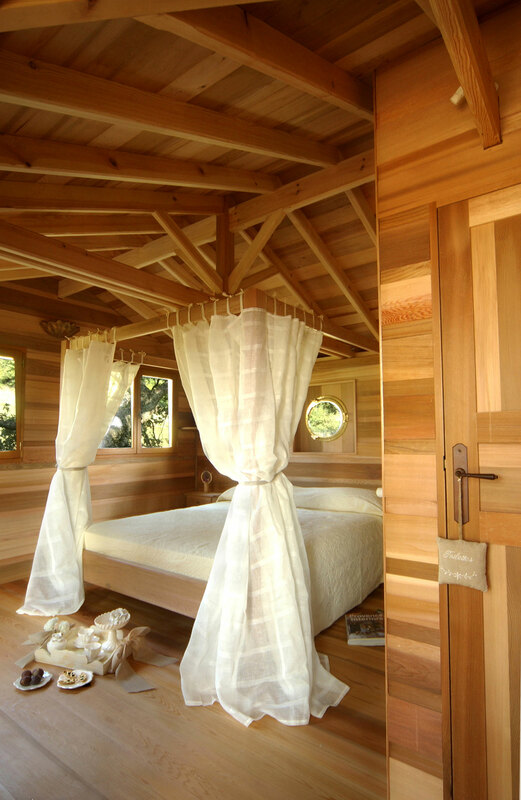 The interior of the treehouse is clean and minimalist, putting the focus squarely on the natural world outside. 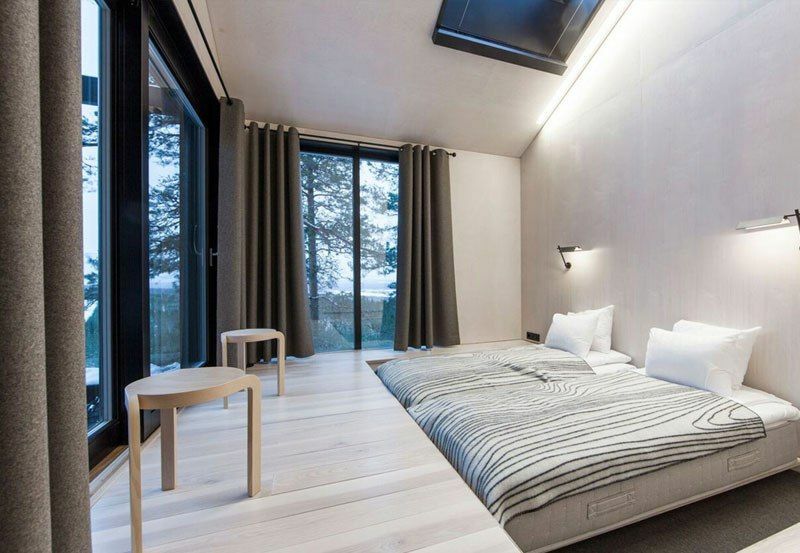 The large window positioned at the foot of the platform bed, along with the skylight, help draw the focus outdoors, which is aided by the white, unadorned interior. 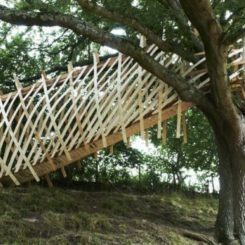 The cantileverd construction gives the feeling of being up in a tree without really leaving the ground. 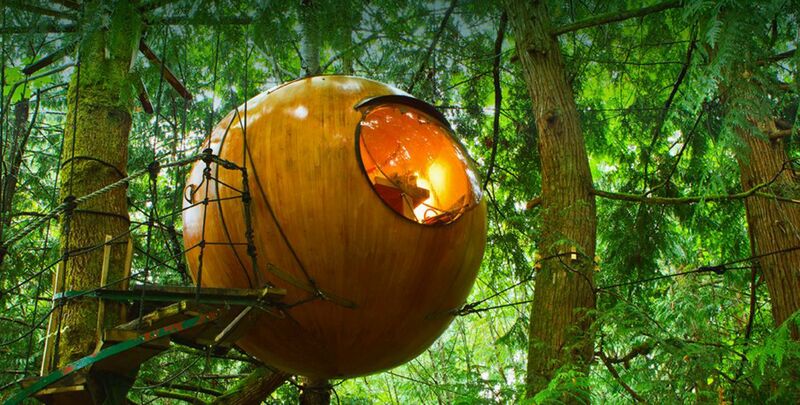 More like little Hobbit ball houses, Free Spirit Spheres are suspended in the trees of the Canadian woods on Vancouver Island’s Qualicum Beach. 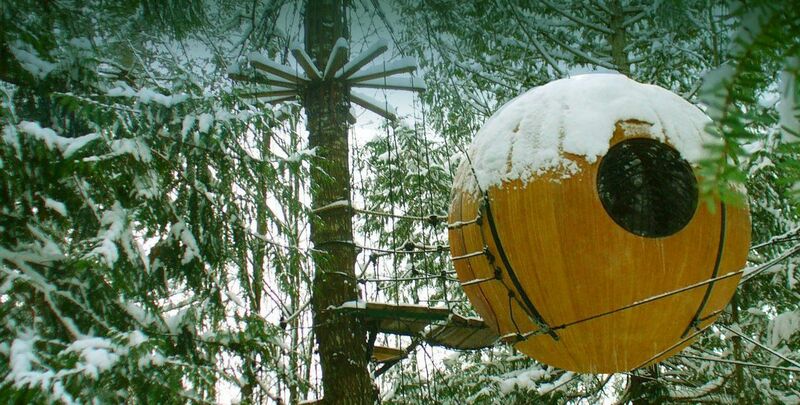 The adults-only resort is peaceful and quiet, with three orbs that can be rented for the night. 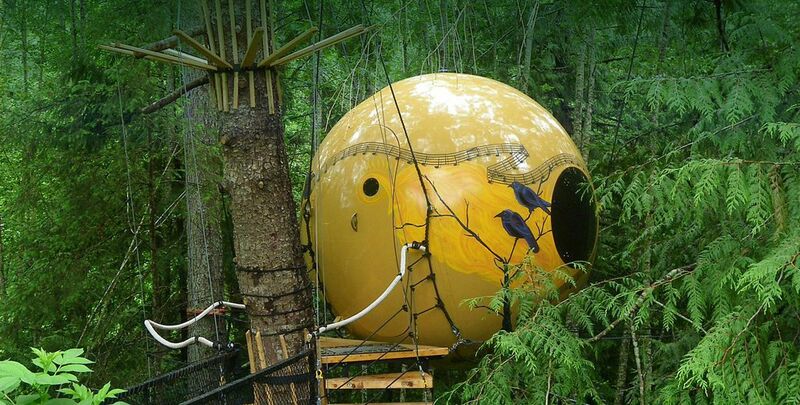 Each orb weighs about a ton and is hung from the trees with polysteel ropes, about five meters off the ground. 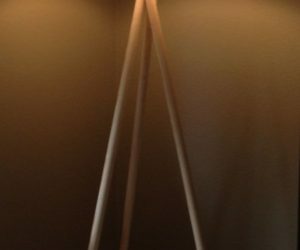 Although they are anchored, the orbs gently sway as guests move about. 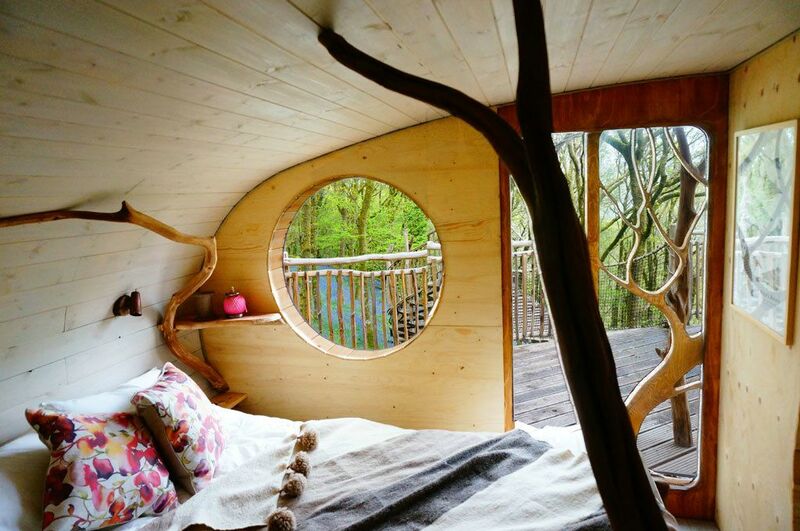 Porthole shaped windows offer views of the trees outside. 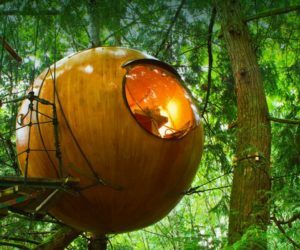 Staying in the sphere is more like glamping than sleeping in a hotel as amenities inside are basic and a pit toilet is located nearby. 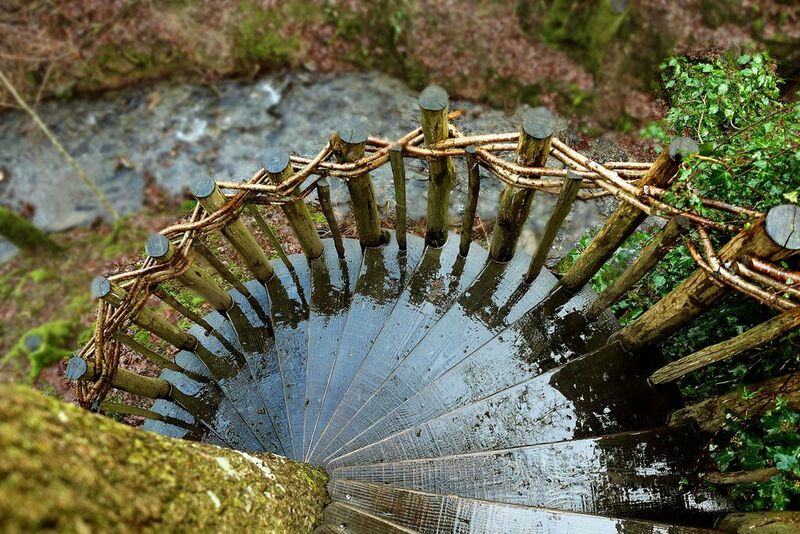 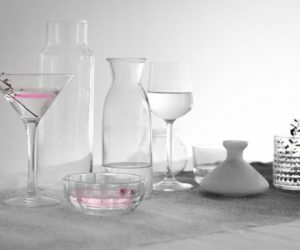 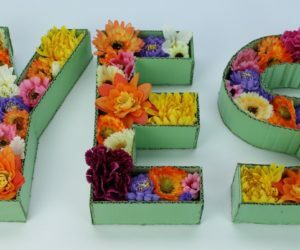 The Free Spirit Sphere experience is designed to be about connecting with natural beauty and disconnecting from the technical world.